This photograph of my mother must’ve been taken around 1954 or so. The two hoodlums with her are my younger brother Michael (aka “the Great Intruder”) and me. I guess I’m about six years old, but I can’t be sure. I was born in 1948; Michael in 1949 – so take your own guess. My mother, Ermila "Emma" Ramos nee Sarmiento, was born in 1927. If I’m correct about the age of the photo, she would’ve been in her twenties when it was snapped, probably by my father. The automobile in the background was a Plymouth from the early 1940s with a very dark blue paint job and, as I recall, an oversized steering wheel. The entire car was bigger than life. I fondly remember, or imagine, riding in the huge back seat, rolling around like a pea in a giant pod, feeling safe thinking that a tank had nothing on the Plymouth Two Door Deluxe Special Sedan. Check out the cool hood ornament, the classy windshield visor, and the ultra-modern antenna. My father always tricked up his rides; made them all his. The size, power, and general robustness of cars from the Forties and Fifties reflected the upfront optimism that the United States projected. Finally seen as a world power in 1954, primarily because of the success of the U.S. military in World War II, the U.S.A. promised a golden future of peace, prosperity, and plenty. Not for everyone, of course. The promise came with strings attached. The general rule was that to share in the golden future, you had to be educated, at least middle-class, and white. There were exceptions, but when they posed in front of the family car, the three people in the picture didn’t know about the rule, much less the exceptions. We thought you just had to be hard-working. So, what’s happening in this Twentieth Century still-life? The most obvious observation is that no one is smiling. In fact, my mother looks downright pissed off, while Mike and I look tense and apprehensive. One thought I had was that she had busted us for some major transgression such as trampling her garden, and was about to administer some good old-fashioned discipline, when my father decided he wanted to try out the new camera. He saved our asses, but clearly, my mother was not done with us yet. Or, maybe we were bummed out because we’d been on a Sunday drive that we had to cut short because Dad needed to save gas to get to his construction job in Colorado Springs on Monday. Or, we had our dinner and were chilling in the front yard when my mother got a call from the motel where she labored as a maid, or the restaurant where she was a waitress, and she had to go in to work on her day off because some one else was sick, or late, or otherwise missing. But then, the photo could simply be one of those where the timing was off, and no one smiled, which often happens when members of the Ramos clan pose for pictures. For all I know, the next one on the roll of film shows everyone with big toothy grins, happy as two little kids and their mother deserved to be on a fine Spring afternoon, in a small Colorado town on the banks of the Arkansas River. 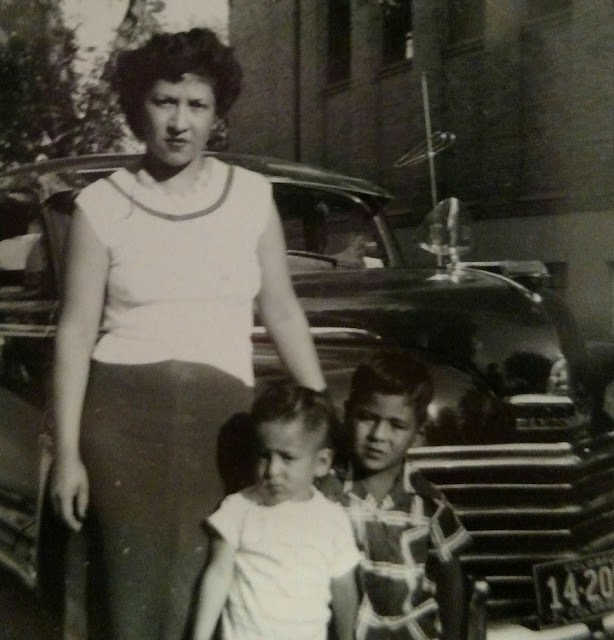 We were with Mom, and we had on clean clothes, and our hair was combed, and we didn’t have dried mocos on our faces and it felt good to be part of the family, in front of the family car. Maybe we didn’t smile because we had to wait to take a picture instead of immediately driving over to Foster’s Drive-In for ice cream cones. Foster’s featured something called a Frosty, and my mother cracked up every time my father placed his order: “Give me a Foster, Frosty.” Mike and I laughed, too, but never as hard as my mother. She probably heard my old man make that order before we were born – did not matter. It was part of the deal they had with each other, part of the package. Make me laugh and I’ll love you forever. Mom and Dad kept their respective sides of the deal. For that, thank you. Emma Ramos passed away on February 3, 2018. She was ninety years old. She lived a long and good life. Manuel Ramos is the author of several novels, short stories, poems, and non-fiction books and articles. His collection of short stories, The Skull of Pancho Villa and Other Stories, was a finalist for the 2016 Colorado Book Award. My Bad: A Mile High Noir was published by Arte Público Press in 2016 and was a finalist for the Shamus Award in the Original Paperback category sponsored by the Private Eye Writers of America. He is hard at work on his next Chicano Noir crime novel.